I'm Andy. I was born and raised in the suburbs of Denver, Colorado and moved to Fort Collins in the mid-90's for school. I spent nearly 20 years in Fort Collins before recently relocating back to Denver. I started consistently venturing into the hills in 2001. At first it was mostly casual backpacking and a little fishing. 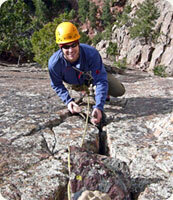 Gradually I began to be attracted to the peaks and in 2002 I climbed Longs Peak with some friends from school. Though I'd been up Longs twice before, this time I really appreciated the experience. Later that summer I bagged my 2nd, 3rd, and 4th fourteeners in Bierstadt, Torreys, and Grays. I was hooked. From there it's been a slow, steady progression of aquiring skills, experience, and gear to tackle more and more interesting routes and peaks. 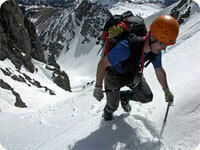 In 2004 I climbed my first snow route and my first 4th class route. In 2005 I lead my first rock pitches. In 2006 I climbed my first ice. In 2008 I lead my first water ice pitches. In 2009 my wife and I had our second son. Adjusting to two children was a little more difficult than I anticipated and in the summer of 2009 I took a sabbatical from climbing to try some distance running (it being easier to find an hour here, or 4 hours there, to go for a quick run rather than the 12+ hours it requires to do anything significant in the hills). I finished my first marathon in the fall of 2009 and my first ultra marathon in 2010. In 2011 I broke my arm badly and lost full range of motion. I was never that great a rock or ice climber but that (along with my lack of talent and drive) pretty much killed my ambition in that area. As my sons grow older my focus has shifted to adventures I can share with them. I've also recently picked bicycling back after a 10-year hiatus. I'm not nearly as competetive as I was when I was in my early 20's, but I race a little and probably will more if my sons get into it. If you would like to contact me I am happy to offer opinions, beta, and advice (as poor as they may be) on any of the climbs I've done or areas I've visited. I'd also be happy to sell my photos, videos, or trip reports/articles to anybody who is interested. To contact me please instant message me on Facebook. I also record pretty much everything even vaguely athletic I do on Strava. © Andy Leach 2002-2019. All Rights Reserved. This page loaded in 0.032 seconds.